Adapted from two different issues of Bon Appétit. 1On a cutting board, pat your pork dry with a paper towel, then drizzle with oil and rub all over to coat. Rub with garlic, then sprinkle with spice mixture or herbs, salt and pepper and rub them in too. 2Preheat oven to 450°F, or preheat your grill to high. Put the pork in a roasting pan and slide it into the oven, or grill it all over, turning with tongs, until nicely golden on all sides. If you're doing it in the oven, roast for 20-30 minutes, then turn the heat down to 300°F. If you grilled it, turn the oven on to 300°F, transfer the pork to a roasting pan or baking dish and put it in the oven. 3Cover and roast for 3 1/2-4 hours, until very tender. If you think of it, take the lid off when you have about an hour left to go. Transfer pork to cutting board and let rest 15 minutes. 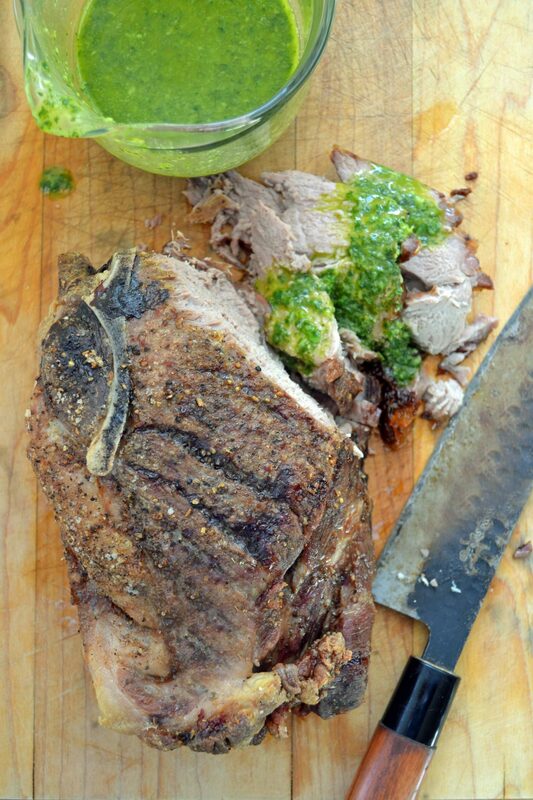 Slice and serve with pan drippings or salsa verde. 4To make the salsa verde, in the bowl of a food processor, pulse everything but the olive oil until well blended and chopped. With the motor running, add the olive oil through the feed tube. Add a pinch of salt, and dribble on porchetta sandwiches.